Easter egg toast. Use the same concept for Christmas, St. Patrick’s Day, Valentine and other “holiday toast” (photos courtesy Arla USA). 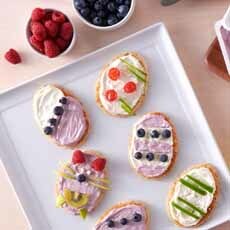 Make Easter egg toast as a holiday treat. 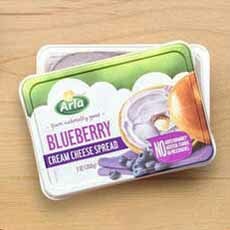 These were made with blueberry cream cheese from Arla USA, maker of cream cheese spreads in blueberry, herbs & spices, peppercorn, original and lite. You can bring these toasts ready-made to the table, or bring the individual ingredients for an assemble-your-own activity. Use the same concept for Christmas toast, Independence Day Toast, St. Patrick’s Day toast, Valentine toast, and so on. 1. SLICE the fruits and vegetables into halves, coins or matchsticks, as desired. 2. CUT the toast into ovals using a large, sharp scissors. You can buy oval cookie cutters, but we printed out an oval template, cut out and placed over the toast as a guideline. Use as croutons to top soups and salads. Toss into omelets or garnish scrambles. Make a savory parfait: cottage cheese and/or plain yogurt layered with toast bits and herbs. *Avoid thick slices or dense breads stuffed with dried fruits and nuts. They’re not as easy to cut into neat ovals.